Residents currently moving into the first Zero Energy Neighborhood in the Portland, OR, senior living marketplace—The Oaks at Rose Villa—are getting a breath of fresh air in more ways than one. The Oaks is a 12-home neighborhood of residences within Rose Villa, a cottage community for senior living set on 22 acres along the Willamette River. It was designed and built by the Portland-based firm Green Hammer to meet their own energy needs through a combination of ultra-energy-efficient design and on-site renewable energy generation. The 12 Zero Energy craftsman-style homes are built to meet Passive House principles that support health and energy efficiency. While residents will likely have low-to-no energy costs, they’ll also enjoy comfortable, quiet homes with fresh, filtered air continuously supplied to bedrooms and living spaces and extracted from bathrooms and kitchens through heat-recovery ventilators, according to the company. 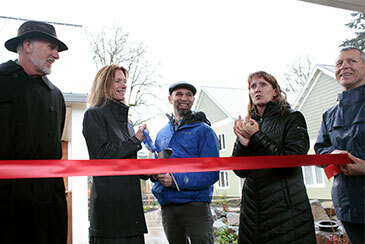 Vassar Byrd, second from left, CEO, Rose Villa, and Stephen Aiguier, founder and president, Green Hammer Design Build, center, prepare to cut the ribbon at the grand opening of The Oaks at Rose Villa. While the homes do cost about 20 percent more upfront to build, Byrd told Senior Living News the energy savings are about 22 percent over the long term, so they pay for themselves. 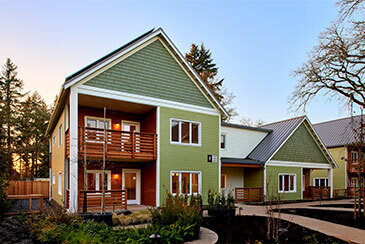 As far as Passive House in senior living, there is nothing else in the northwest and still only a handful in the country, according to Byrd, who holds master’s degrees in economics and gerontology and is president-elect of the LeadingAge Oregon Board of Directors. But she hopes that boomers will be so loud in their demand that building codes will have to change in regard to people’s health. In 2016, Rose Villa completed a $60 million campus redevelopment, including 75 new homes and “Main Street”—a village center with restaurants, a garden store, a rooftop deck, a spa and more. The residences within The Oaks—each about 1,200 square feet—are organized as triplexes clustered around a central courtyard. Construction started in December 2017, and the project sold out prior to build-out. There’s a wait list for more, and Byrd is confident as more are built, they’ll fill just as fast. Committed to creating a robust community with many opportunities for residents to live their social and environmental values, Byrd is thrilled that Rose Villa will have to build more bike racks and probably create a bike team. The average age of entry is 74, and residents are bringing their bikes, kayaks, personal watercrafts—and dogs. Stephen Aiguier, Green Hammer Design Build founder and president, says neighborhoods like The Oaks are proving that Zero Energy homes are entirely possible today. “I think a lot of companies just don’t know how to take the next step forward, people not being able to grasp the issues, especially the health implications,” Aiguier told Senior Living News when asked why Green Hammer is just one of 10 in the nation meeting the goals of the American Institute of Architects’ (AIA) 2030 Commitment—a voluntary path toward carbon neutrality in the built environment—and why more companies aren’t doing this kind of building. He applauds Byrd’s excitement for The Oaks project and her interest in creating a vibrant senior living community. “Vassar is just a sheer force of nature—an incredibly impactful and visionary business leader. She’s rightfully excited to have developed this brilliant walkable campus, to invest in this new era of construction—by taking a long-term view on the value for the residents and the campus, she’s proved a healthy future is viable,” said Aiguier. 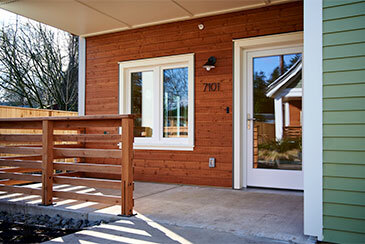 The 12 new Zero Energy homes in The Oaks are designed to significantly minimize environmental impact. 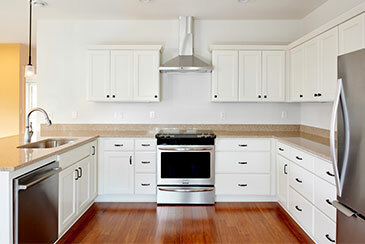 Super-airtight insulation reduces the heating and cooling load by nearly 90 percent. Energy-efficient hot water heat pumps, LED lighting, ENERGY STAR appliances, triple-panel windows, advanced framing techniques and WaterSense-certified showerheads, faucets and toilets all significantly reduce water and energy use, as well as residents’ bills. Rose Villa is preparing for its third and final redevelopment project in 2020, culminating in the construction of a next-generation 24-hour, long-term-care neighborhood along with more independent-living homes and a second Zero Energy housing project in partnership with Green Hammer.